Don’t miss it ladies and gents; this really is a treat that you deserve. Review: Baltern Spa Face Mask - 100% Moorland Peat! Yes, Peat! Product of the week! Ep55 Wed 18th March. 'Dancing On Ice' stars need bathtime help! Balton Spa are supplying their popular beauty products to the skaters and celebrities for Dancing on Ice. In particular, the 100% natural Face Mask, already a Cult product with many A list Celebs, and their 100% natural Herbal Bath Liquid. The Herbal Bath Liquid is used by leading Spas throughout Europe. This product seemed perfect to relieve the stresses and strains, after the dancers had been training and performing on Ice! Muscles are eased, aches, pains and sprains are soothed and relieved with the Herbal Bath Liquid. Balaton Spa – A mineral miracle! 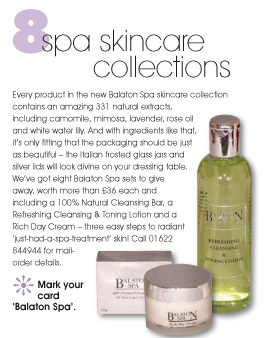 Balaton Spa Travel Bag, special Pick Me Up magazine offer an incredible 30% off. Tried and Tested area for great reviews on a diverse range of new products in the market. "What we thought: In a word 'fabulous' "
Balaton Spa has won Nestle Heaven's Skincare Product of the Month. 8 things to try and buy this weekend. The Fashion & Beauty Boutique. English newspaper devoted to Inland news. Beauty lover hoping to share her obsession with the world. Treat: Meet a Peat Treat! Beauty and the Dirt. For all your celebrity and fashion news, reviews, profiles and gossip. Marie Claire Magazine. - for women of style and substance. Inside. The weekend woman's weekly. Sunday Magazine (PDF 2MB) 8 Spa skincare collections.